My Maverick HPX-T and Pathfinder 2400 TRS are posing and ready for some action on this beautiful Saturday in Rockport, Texas. These are perfect boats for our water, with miles of very shallow flats, but the Gulf is only minutes away. Thanks to all... Cesarean done, both went through that well. Abby (the baby) already underwent her 1st surgery before being 8 hours old and she's showing she's a fighter already. Getting ready for the next step, one day, hour or minute at a time! Prayers seem to be working so far, so keep them coming! Just an update Tomorrow Abbey will be 1 week old Her condition even if still critical and very fragile, has been slowly stabilizing allowing time to take it's course This premature babies seem to be in embryonic stages still... their ability to recover from major injuries and/or adapt is amazing!!! Prayers are working Thanks to all. Results are in! Running the new prop as I type this. PowerTech PTR4, 20inch pitch. Hit 6200rpm (top rpm for this engine), with the tide, against a pretty good breeze, 30+gal fuel, 2 men. 41.1mph a top rpm. Jack plate all the way down, trimmed out just enough to reach rev limit. I am super pleased. Big shout out to Marcus a PowerTech with his knowledge! Phenomenal grip, holeshot, and good stern lift (but not too much to make it a trimming nightmare). Thanks for all the support guys. It means a lot. I'm kind of grateful that the suffering is over for the little angel and all of the ones that loved her and suffered with her. She will be remembered and loved. PowerTech PTR4x20 arrives today! Can't wait to give it a run this weekend and see what she does. Yesterday morning from the hoist at Ft. Mac. marina. Buddy of mine fishes the Pamlico Sound up here in NC. I always tell him that I would put the "Pam" up against any part of FL any day in terms of fishing variety and quality. He gets all down on himself when he has a double digit day because triple digit days are so common. We are the last state in the union with Gill nets, so you can only imagine what it would be like if we could ban them. Probably worth noting that the guys up here worship trout like Florida boys do Snook. Always makes me laugh a bit, having my roots in FL where trout were kind of a by catch. Here is the text he sent me: Big trout bite today, found em at 11, Dad got the biggest at 27.5", I had a 24.5", both released. We kept a 23.5, 22.5, 21 and a 16". Almost 3 citations in one day. It’s all about perspective and what your into. I had a friend tell me the same thing when I bought mine... when we were done hanging out he and his wife drove up to Ocala in a Denali dually to put a $25K deposit on a horse that wasn’t conceived yet. Not sure if anyone is still reading this thread, but I'll keep it going anyway. Just a quick update - work continues to grind away. I stopped by the shop this a.m. to check things out. Plumbing had been dry fitted and missing hoses were identified and purchased. They were in the process of installing the plumbing when I got there, and the deck was in position to be put into place. He had obviously been doing work to test and re-attach the wiring, because he discovered that one of my trim tab actuators had gone kaput. Took it to a shop and it's DOA, so ~$200 later I have one new trim tab actuator. At that price, I'll ride the other one as long as it works before replacing it. Man, expensive little suckers! On a bright note, I sold my ipilot yesterday, so I'll be installing the new version with the blue tooth puck when I get the boat back. I'd considered doing a jackplate, but the poling platform would have to be modified too much. I'd considered a power pole, but just couldn't get excited enough about it. I use the TM 99% of the time and that wandering spot lock always drove me crazy, so I figured I'd start there and add the other elements down the road. Shop says 4/15 completion which I got excited about until I realized they hadn't specified the year. Thanks for all of the help, we had a great time in Islamorada last week. The weather cooperated for 2 offshore fishing days, one successful and one not so much. We were able to spend some time in the backcountry as well. Also some successful and some not so much. 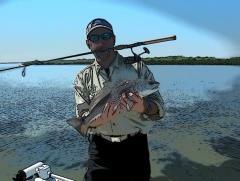 A nice Cobia was the highlight of the trip and a Seatow trip was the lowlight. Thank goodness for being a member and for an easy fix that didn't ruin the trip! Sucked something up in the backcountry and threw a temp alarm...flushed it out...and back to fishin! Great day in the Park yesterday on Mike's HPX-18 (In-the-Slot 12). Clear skies, cool temp's, big moon/big tides, nice breeze to keep the skeeters away. Low tide at Shark River entrance was at 10:30 or so, so we had several hours of falling water to fish in the morning. Both anglers finished the day with slams, dozens of snook and rat reds, some nice sea trout, and a mixture of other fish. We fished soft plastics, live and GULP! shrimp on jig heads, and plugs. Water was cold (around 68 degrees all morning) and murky. Here are a few pictures from the day. If was a Maxxis 8008 guy forever until last year. I had a tread seperate and while it was covered under warranty the nearest authorized dealer who could change the tire under warranty was in the Tampa area. I live in Homestead. They are great tires no doubt and I think that was my 3rd or 4th pair but I switched to the Goodyear Endurance radials Incase I had another issue... there’s Goodyear shops everywhere. From yesterday evening while running my friend’s boat back to the ramp after replacing a wheel hub on his trailer. I received the comms board today, installed it and it's working perfectly, with anchor stowed no less. I was able to calibrate the compass and center position. I can't say enough about the service at Rhodan! !, Being a FLA Company.. They just wanna make it right and strive to have the same reputation as Power-pole for service and reliability(ahem).. So far so good, I will buy from them in the future. Rumor has it that they supply these boards to the other manufacturers. I dunno but they are a GPS company 1st.. Thanks for chiming in.. When the FA report, Doh, shows up I'll post it. Crazy, unpredictable wind and water temps have made for some unsure fishing but I’ve managed to enjoy some decent fly fishing and put some meat in the box.